Immigration to Canada is the process by which people migrate to Canada to reside there. The majority of these people become Canadian citizens. After 1947, domestic immigration law and policy went through major changes, most notably with the Immigration Act, 1976, and the current Immigration and Refugee Protection Act from 2002. In Canada there are four categories of immigrants: family-class (closely related persons of Canadian residents living in Canada), economic immigrants (skilled workers and business people), refugees (people who are escaping persecution, torture or cruel and unusual punishment), and the humanitarian and other category (people accepted as immigrants for humanitarian or compassionate reasons). In 2016, Canada admitted 296,346 permanent residents, compared to 271,845 the previous year – the highest admissions levels since 2010. Of those admitted, 53% were economic immigrants and their accompanying immediate families; 26% were family class; 20% were either resettled refugees or protected persons; and 1% were in the humanitarian and other category. According to data from the 2016 census by Statistics Canada, 21.9% of the Canadian population reported they were or had ever been a landed immigrant or permanent resident in Canada – nearly the 22.3% recorded during the 1921 Census, which was the highest level since the 1867 Confederation of Canada. More than one in five Canadians were born abroad, and 22.3% of the population belonged to visible minorities, of whom 3 in 10 were born in Canada. In 2013–2014, most of the Canadian public, as well as the major political parties, supported either sustaining or increasing the current level of immigration. A 2014 sociological study concluded that "Australia and Canada are the most receptive to immigration among western nations". However, in 2017, the majority of Canadians indicated that they agree that Canada should accept fewer immigrants and refugees. Canadian immigration policies are still evolving. In 2008, Citizenship and Immigration Canada made significant changes to streamline the steady flow of immigrants, such as changes reducing professional categories for skilled immigration as well as caps for immigrants in various categories. In 2015, Canada introduced the Express Entry system, providing a streamlined application process for many economic immigrants. Additional changes were made in April and May 2017. In November 2017, Immigration Minister Ahmed Hussen announced that Canada would admit nearly 1 million permanent residents to Canada over the following three years, rising from 0.7% to 1% of its population by 2020. This increase was motivated by the economic needs of the country facing an aging demographic, with the number of senior citizens expected to double by 2036 alongside a decline in the proportion of working-age adults. 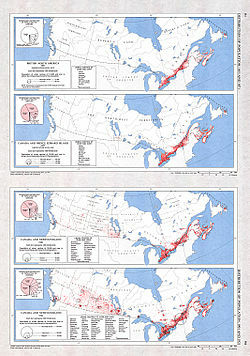 A collection of four maps showing the distribution of the Canadian population for 1851 (Newfoundland 1857), 1871 (Newfoundland 1869), 1901 and 1921 by historical region. Come to Stay, printed in 1880 in the Canadian Illustrated News, which refers to immigration to the "Dominion". After the initial period of British and French colonization, four major waves (or peaks) of immigration and settlement of non-aboriginal peoples took place over a period of almost two centuries. The fifth wave is currently occurring. The first wave of significant, non-aboriginal immigration to Canada occurred over almost two centuries with slow but progressive French settlement of Quebec and Acadia with smaller numbers of American and European entrepreneurs in addition to British military personnel. This wave culminated with the influx of 46–50,000 British Loyalists fleeing the American Revolution, chiefly from the Mid-Atlantic States mostly into what is today Southern Ontario, the Eastern Townships of Quebec, New Brunswick and Nova Scotia of whom 36,000 went to the Maritimes. Some of these later made their way to Ontario. A second wave of 30,000 Americans settled in Ontario and the Eastern Townships between the late 1780s and 1812 with promises of land. Some several thousands of Gaelic-speaking Scottish Highlanders from forced land clearances in Scotland migrated to Cape Breton, Nova Scotia and parts of Eastern Ontario during this period. It marked a new age for Canada and its people. The second wave, mainly consisting of British and Irish immigrants or the Great Migration, encouraged immigrants to settle in Canada after the War of 1812, and included British army regulars who had served in that war. In 1815, 80% of the English-speakers in Canada who numbered 250,000 were either American colonists, or their descendants. By 1851 their percentage had dropped to 30%. The colonial governors of Canada, who were worried about another American invasion attempt and to counter the French-speaking influence of Quebec, rushed to promote settlement in back country areas along newly constructed plank roads within organized land tracts, mostly in Upper Canada (present-day Ontario), much of the settlements were organized by large companies to promote clearing, and thus farming of land lots. With the second wave Irish immigration to Canada had been increasing, small numbers to organized land settlements but many more arriving to work on canals, timber, railroads and then peaked when the Irish Potato Famine occurred from 1846 to 1849 resulting in hundreds of thousands more Irish arriving on Canada's shores, although a portion migrated on to the United States, either in the short-term or over the subsequent decades. At least 800,000 immigrants arrived between 1815 and 1850, 60% of them British (English and Scottish) and the remainder mostly Irish. This movement of people is known as the Great Migration boosted Canada's population from approximately 500,000 in 1812 to 2.5 million by 1851. Ontario (Upper Canada): 952,000; Quebec (Lower Canada): 890,000 – about a quarter of whom spoke English as a first language; the Maritime provinces: 550,000. The French-speaking population was roughly 300,000 in 1812 and had increased to approx. 700,000 by the 1851 census. Demographically it had swung to a majority English-speaking country. The Dominion Lands Act of 1872 copied the American system by offering ownership of 160 acres of land free (except for a small registration fee) to any man over 18 or any woman heading a household. They did not need to be citizens, but had to live on the plot and improve it. Also during this period, Canada became a port of entry for many Europeans seeking to gain entry into the U.S. Canadian transportation companies advertised Canadian ports as a hassle-free way to enter the U.S. especially as the U.S. began barring entry to certain ethnicities. The U.S. and Canada mitigated this situation in 1894 with the Canadian Agreement which allowed for U.S. immigration officials to inspect ships landing at Canadian ports for immigrants excluded from the U.S. If found, the transporting companies were responsible for shipping the persons back. Clifford Sifton, minister of the Interior in Ottawa, 1896–1905, argued that the free western lands were ideal for growing wheat and would attract large numbers of hard-working farmers. He removed obstacles that included control of the lands by companies or organizations that did little to encourage settlement. Land companies, the Hudson's Bay Company, and school lands all accounted for large tracts of excellent land. The railways kept closed even larger tracts because they were reluctant to take legal title to the even-numbered lands they were due, thus blocking sale of odd-numbered tracts. Sifton broke the legal log jam, and set up aggressive advertising campaigns in the U.S. and Europe, with a host of agents promoting the Canadian west. He also brokered deals with ethnic groups that wanted large tracts for homogeneous settlement. His goal was to maximize immigration from Britain, eastern Canada and the U.S. The third wave of immigration coming mostly from continental Europe peaked prior to World War I, between 1911–1913 (over 400,000 in 1912), many from Eastern or Southern Europe. The fourth wave came from Europe after the Second World War, peaking at 282,000 in 1957. Many were from Italy and Portugal. Pier 21 in Halifax, Nova Scotia was an influential port for European immigration; Pier 21 received 471,940 Italians between 1928 until it ceased operations in 1971, making Italians the third largest ethnic group to immigrate to Canada during that time period. Together, they made Canada a more multi-ethnic country with substantial non-British or non-French European elements. For example, Ukrainian Canadians accounted for the largest Ukrainian population outside Ukraine and Russia. The Church of England took up the role of introducing British values to farmers newly arrived on the prairies. In practice, they clung to their traditional religious affiliations. Periods of low immigration have also occurred: international movement was very difficult during the world wars, and there was a lack of jobs "pulling" workers to Canada during the Great Depression in Canada. Canadianization was a high priority for new arrivals lacking a British cultural background. Immigrants from Britain were given highest priority. There was no special effort to attract Francophone immigrants. In terms of economic opportunity, Canada was most attractive to farmers headed to the Prairies, who typically came from eastern and central Europe. Immigrants from Britain preferred urban life. Prior to 1885, restrictions on immigration were imposed mostly in response to large waves of immigration rather than planned policy decisions, but not specifically targeted at one group or ethnicity, at least as official policy. Then came the introduction of the first Chinese Head Tax legislation passed in 1885, which was in response to a growing number of Chinese working on the Canadian Pacific Railway. Subsequent increases in the head tax in 1900 and 1903 limited Chinese entrants to Canada. In 1907 a major riot against Asians took place in Vancouver, BC. In 1923 the government passed the Chinese Immigration Act which excluded Chinese from entering Canada altogether between 1923 and 1947. For discriminating against Chinese immigrants in past periods, an official government apology and compensations were announced on 22 June 2006. Immigration since the 1970s has overwhelmingly been of visible minorities from the developing world. This was largely influenced in 1976 when the Immigration Act was revised and this continued to be official government policy. During the Mulroney government, immigration levels were increased. By the late 1980s, the fifth wave of immigration has maintained with slight fluctuations since (225,000–275,000 annually). Currently, most immigrants come from South Asia, China and Caribbean and this trend is expected to continue. The term Canadian as a term of nationalism or citizenship was first used under the Immigration Act, 1910, to designate those British subjects who were domiciled in Canada. All other British subjects required permission to land. A separate status of "Canadian national" was created under the Canadian Nationals Act, 1921, which was defined as being a Canadian as defined above, their wives, and any children (fathered by such citizens) that had not yet landed in Canada. After the passage of the Statute of Westminster in 1931, the monarchy ceased to be an exclusively British institution. Because of this Canadians, and others living in countries that became known as Commonwealth realms, were known as subjects of the Crown. However, in legal documents the term "British subject" continued to be used and "Canadians" were officially British Subjects born or regularly domiciled in Canada. Canada was the first nation in the then British Commonwealth to establish its own nationality law in 1946, with the enactment of the Canadian Citizenship Act 1946. This took effect on January 1, 1947. In order to be deemed a Canadian citizen on January 1, 1947, one generally had to be a British subject on that date, or had been admitted to Canada as landed immigrants before that date. First Nations people were later included by amendment in 1956. The phrase British subject refers in general to anyone from the United Kingdom, its colonies at the time, or a Commonwealth country. Acquisition and loss of British subject status before 1947 was determined by United Kingdom law. Canada offers Canadian citizenship through naturalization. In 2006 the Canadian government reduced the landing fee per immigrant by 50%. In June 2017 the implementation of the first of a series of important reforms to the Citizenship Act took effect. These reforms restored many of the previous requirements that were in place for more than 3 decades in Canada before they were removed and replaced with more stringent criteria by the former Conservative government in 2015. The most important changes include permanent residence is now a requirement for 3 years out of 5 years during the period immediately prior to filing the application. There is no longer a physical presence rule. Persons aged 14 to 54 years must pass knowledge of Canada test and demonstrate a basic ability in either of English or French, Canada's official languages. Revocation of citizenship must follow a more formal and balanced process. On 15 February 1977, Canada removed restrictions on dual citizenship. Many of the provisions to acquire or lose Canadian citizenship that existed under the 1946 legislation were repealed. Canadian citizens are in general no longer subject to involuntary loss of citizenship, barring revocation on the grounds of immigration fraud. Statistics Canada has tabulated the effect of immigration on population growth in Canada from 1851 to 2001. Emigration from Canada to the United States has historically exceeded immigration, but there were short periods where the reverse was true; for example, the Loyalist refugees; during the various British Columbia gold rushes and later the Klondike Gold Rush which saw many American prospectors inhabiting British Columbia and the Yukon; land settlers moving from the Northern Plains to the Prairies in the early 20th century and also during periods of political turmoil or during wars, for example the Vietnam War. There are over 1 million Canadians living in the US (many millions more descendants of Canadian immigrants to the US – New England alone is 20–25% of Canadian descent) and 1 million Americans living in Canada. It should be noted that immigration has always been offset by emigration: at times this was of great concerns of governments intent on filling up the country, particularly the western provinces. The United States was overall the primary destination followed by reverse migration. As a result, the population of Canada at Confederation (1867) was 3.75 million, or 10% of the US population, this average was maintained from about 1830 to 1870. It dropped to 6% by 1900 due to large emigration to the US and in spite of large-scale immigration to Canada. Emigration to the US was only 370,000 in the 1870s; averaged a million a decade from 1880 to 1910; almost 750,000 from 1911 to 1920 and 1.25 million from 1921 to 1930.They consisted of both native born Canadians and recent immigrants from various, mostly European nations. Between 1945 and 1965 emigration to the US averaged 40–45,000 annually. It was not until 1960 that the population of Canada reached the 10% mark again, or 18 million. Today (2017) with over 35 million people, Canada has 10.8% the population of its southern neighbour. In times of economic difficulty, Canadian governments frequently resorted to deportation and coerced "voluntary" deportation to thin out ranks of unemployed workers; however, by the time of the Mackenzie-King government it was realized that this was an improvident short-term solution resulting in future labor shortages (that immigration was initially intended to overcome). The social component – Canada facilitates family reunification. The humanitarian component – Relating to refugees. The economic component – Attracting immigrants who will contribute economically and fill labour market needs. The level of immigration peaked in 1993 in the last year of the Progressive Conservative government and was maintained by Liberal Party of Canada. Ambitious targets of an annual 1% per capita immigration rate were hampered by financial constraints. The Liberals committed to raising actual immigration levels further in 2005. All political parties are now cautious about criticizing the high level of immigration. Consequently, immigration levels to Canada (roughly 0.7% per year) are considerably higher per capita than to the United States (about a million, or 0.3%, per year). Further, much of the immigration to the United States is from Latin America, with relatively less from Asia; the United States only admits about twice as many immigrants from Asian countries like China, India, the Philippines, and Pakistan as Canada, despite having nine times the population. Due to this, the largest minority in the United States is the Latin American population, while Canada's largest minority is its Asian population. Immigrant population growth is concentrated in or near large cities (particularly Vancouver, Toronto, and Montreal). These cities are experiencing increased services demands that accompany strong population growth, causing concern about the capability of infrastructure in those cities to handle the influx. For example, a Toronto Star article published on 14 July 2006 authored by Daniel Stoffman noted that 43% of immigrants move to the Greater Toronto Area and said "unless Canada cuts immigrant numbers, our major cities will not be able to maintain their social and physical infrastructures". Most of the provinces that do not have one of those destination cities have implemented strategies to try to boost their share of immigration. While cities are a popular destination for new immigrants, some small towns have seen an influx of immigration due to economic reasons and local schools districts are working to adjust to the change. According to Citizenship and Immigration Canada, under the Canada–Quebec Accord of 1991, Quebec has sole responsibility for selecting most immigrants destined to the province. Of course, once immigrants are granted permanent residency or citizenship they are free to move between and reside in any provinces under Section 6 of the Canadian Charter of Rights and Freedoms. In August 2017, the border between Quebec and New York, saw an influx of up to 500 illegal crossings each day, by people seeking asylum in Canada. Canada increased border patrol and immigration staffing in the area, and reiterated that crossing the border illegally had no effect on one's asylum status. It is reported that there over 38,000 irregular migrants arrived in Canada since early 2017. For the same reason both Ontario and Quebec have requested the central government to provide $200 million or more to cover their cost of burden to house and provide services to asylum seekers. Related to asylum seekers, Canada joined 164 countries in signing the UN Global Compact for Migration in 2018. The 2017 government claims it is for following careful measures and to meet international obligations in accommodating irregular migrants. Citizenship and Immigration Canada uses seven sub-categories of economic immigrants, and includes skilled workers under these classes: Quebec skilled worker class, federal skilled trades, the federal skilled worker program, the provincial nominee class and the Canadian experience class. The process is done by submitting an online profile to the Express Entry pool, under one of 3 federal Canada immigration programs or a provincial immigration program. The highest ranked candidates are getting invited to apply for permanent residence. Individuals with a certain net worth can also apply for permanent residence via certain programs. The high-profile Skilled worker principal applicants group comprised 19.8% of all immigration in 2005. Canada has also created a VIP Business Immigration Program which allows immigrants with sufficient business experience or management experience to receive the Permanent Residency in a shorter period than other types of immigration. As of May 1, 2014, the Federal Skilled Worker Class opened once again accepting 25,000 applicants with intake caps at 1,000 per category. A New Economic Action Plan 2015 took effect in January 2015 in which the skilled worker program will be more of an employer based program. The current list of accepted occupations for 2014 includes many occupations such as senior managers, accountants, physicians and medical professionals, professionals in marketing and advertising, real estate professionals and many more. The changes in 2015 moved permanent residency in Canada away from the "first come, first served' model, and towards a new structure that took on permanent residents based on Canada's economic need. The new system is called "Express Entry". In Alberta in particular, an Immigrant Nominee Program (AINP)  allows skilled workers, along with their families, to make application for permanent residency, and several large Alberta employers with operations in rural areas actively recruit employees from abroad and support them and their families in seeking permanent residency. Effective August 2, 2016, all home buyers who are not Canadian citizens nor have landed immigrant status are obliged to pay a 15% Property Transfer Tax when purchasing residential property in the Greater Vancouver Regional District. Under a government program, both citizens and permanent residents can sponsor family members to immigrate to Canada. In 2010, Canada accepted 280,681 immigrants (permanent and temporary) of which 186,913 (67%) were Economic immigrants; 60,220 (22%) were Family class; 24,696 (9%) were Refugees; and 8,845 (2%) were others through working holidays, internships, and studies. Convention Refugees: Someone who is outside and unable to return to their home country due to a fear of persecution based on several factors including race, religion, and political opinion. A person in need of protection: Claims for asylum under this category are usually made at a point of entry into Canada. Those claiming to be a person in need of protection must be unable to return to their home country safely because they would be subjected to a danger of torture, risk for their life or risk of cruel and unusual treatment. After entry and eligibility interview the asylum seeker is either allowed or declined admission. Those who are admitted submits in writing their reasons of admissibility. The refugee board hears their case after 60 days and in favorable terms the claimants are accepted as refugees. If the claims are not seen appropriate by the interviewers, the asylum seekers may be deported, and there are many instances that make a persons claim ineligible for referral to the IRB. Notably those who seek entry into Canada through the U.S, were the Canada-U. S Safe Third Country Agreement (STCA) is applied. The STCA is responsible for limiting refugee eligibility to enter Canada and the rejection of several hundred claims a year since its implementation. The Canadian Border Services Agency(CBSA) reported a drop in the number of claims from 6,000-14,000 before its implementation to an average of 4,000 claims per year after its implementation. Asylum claimants have been subjected to "indirect-refoulment", a consequence of a persons claim in Canada being refused under the STCA, subjecting them to deportation to the destination in which the person was originally seeking asylum from, due to more conservative immigration and refugee policies in the U.S.
Asylum seekers arriving at a point of entry on the Canadian border have been subject to incarceration and detention, due to the passing of Bill C-31 in December, 2012. Often, claimants are subject to detention for failing to provide sufficient identification documents, which is in violation with the United Nations Refugee Convention, to which Canada is a signatory. In 2010-2011, Canada detained 8,838 people, of which 4,151 of them were asylum seekers or rejected refugee claimants. There is a requirement to the maximum time limit spent in detention upon being released, a situation which has been subject to criticism held in contrast to areas in Europe: Ireland (30 days), France (32 days), Spain (40 days), and Italy (60 days). Canada receives its immigrant population from almost 200 countries. Statistics Canada projects that, by 2031, almost one-half of the population could have at least one foreign-born parent. The number of visible ethnocultural composition of population will double and make up the minority of the population of cities in Canada. Immigrant refers to all those who hold or have ever held permanent resident status in Canada, including naturalized citizens. China 649,260 8.61% 1.85% The official name is "People's Republic of China". These figures exclude Hong Kong and Macau, which have separate lines below in this table. United Kingdom 499,120 6.62% 1.42% From England, Northern Ireland, Scotland, and Wales. Hong Kong 208,935 2.77% 0.59% Special administrative region of the People's Republic of China. Australia 21,115 0.28% 0.06% Includes Norfolk Island. Ivory Coast 11,325 0.15% 0.03% Also known as Côte d'Ivoire. New Zealand 9,880 0.13% 0.03% Includes Niue and Tokelau. Myanmar 8,215 0.11% 0.02% Also known as Burma. Palestine 8,210 0.11% 0.02% Composed of the Gaza Strip and the West Bank. Macau 5,750 0.08% 0.02% Special administrative region of the People's Republic of China. 164 Others 1,035 0.01% 0% Includes a small number of immigrants who were born in Canada, as well as other places of birth not classified elsewhere. North Korea 780 0.01% 0% The official name is 'Democratic People's Republic of Korea'. East Timor 25 0% 0% Also known as Timor-Leste. St. Helena 10 0% 0% Now known as St. Helena, Ascension and Tristan da Cunha. China 28,696 11.5% Hong Kong, Macau and Taiwan included separately. Israel 1,967 0.8% Does not include the Gaza Strip, the Golan Heights, or the West Bank. Hong Kong 820 0.3% Special administrative region of the People's Republic of China. Sudan 488 0.2% Now divided into Sudan and South Sudan. Palestine 261 0.1% Includes the Gaza Strip and the West Bank. Macau 29 0% Special administrative region of the People's Republic of China. Serbia 25 0% Now divided into Serbia, and Montenegro. In 2012 more than 200,000 people were admitted to Canada under the Temporary Foreign Worker Program, three times the number in 2002. An individual that come to Canada through Temporary Foreign Worker Program can only stay on work permit for 3 years. Settlement workers help immigrants into Canada understand their rights and responsibilities and find them programs and services they need to integrate with the new culture and the prospects of a livelihood. They motivate organizations to hire immigrants and support immigration through recruiting new members/ employees. They work with government agencies, school boards, libraries and other community organizations with networks of resources. These working relationships also help to provide families with the tools necessary to manage the changing identities of new immigrant families to Canada. In 2011 and 2012, several families were denied immigration to Canada because members of their family have an autism spectrum diagnosis and Citizenship and Immigration Canada felt the potential cost of care for those family members would place an excessive demand on health or social services. People with autism disorders can be accepted if they are able to depend on themselves. The federal government were asked by businesses to expand programs for professional immigrants to get Canadian qualifications in their fields. In response, the Canadian Council on Learning was created by the federal government to promote best practices in workplace learning. Additionally the credentials of the immigrant workers are assessed through Canadian agencies by the Immigration, Refugees and Citizenship Canada for immigration. This ideally reduces the gap of education and suitable jobs. However, strains of discrimination within the society leads to a systemic process of rejecting and discouraging immigrants, this sort of statistical discrimnation is prevalent in the anti-oppressive culture. Quebec in 2017 stated that the province prohibit offering or receiving a public service to people covering their faces like wearing chador, niqab or burka. The reasoning behind the bill was to ensure protection of Quebeckers, but the discriminatory strain of the political ideology was reported to be aimed at articles of certain religious faiths. It is common in the Quebec winters for everyone to cover their faces, while getting in a bus or standing in queue for other outdoor public services. Hence the bill itself is under question of Canadian policy in regards tolerance for accommodation. A qualitative study found that taste-based discrimination is more prevalent in cities rather than semi-urban areas. The major factors that contributed to less hostility were regional differences in industrial composition and attendant labour demand. The Quebeckers have been urging the province to charge additional fees from the immigrants before landing Quebec for French language training, so that the newcomers can start training in the language and culture of the community for better integration. The earnings differential between immigrants and Canadian-born individuals in Quebec is at a narrow by about 20 percent due to the lack of same average literacy scores. This is close to dysfunction when the Canadian Council on Learning in 2008 reported that almost half of Canadian adults are below the internationally accepted literacy standard for coping in a modern society. Across Canada, businesses have proposed to allow unpaid or basic pay internships, which are currently considered illegal in many provinces (both in government and private) and poses as a major obstacle to integrate immigrants into the working sector. The lack of policy leadership in this sector has resulted in a "catch-22” situation where employers want experience, but potential employees cannot get experience without a job/ internships. Estimates of illegal immigrants in Canada range between 35,000 and 120,000. James Bissett, a former head of the Canadian Immigration Service, has suggested that the lack of any credible refugee screening process, combined with a high likelihood of ignoring any deportation orders, has resulted in tens of thousands of outstanding warrants for the arrest of rejected refugee claimants, with little attempt at enforcement. A 2008 report by the Auditor General Sheila Fraser stated that Canada has lost track of as many as 41,000 illegal immigrants. An October 2016 study of Canadian values by pollster Angus Reid gave a conflicting picture that about 68% of those polled said they wanted minorities to do more to fit into the mainstream, the same number also said they were nonetheless happy with how the immigrants were integrating themselves into the community. Further, 79% of Canadians believe immigration policy should be based on the country's economic and labour needs, rather than on the needs of foreigners to escape crises in their home countries. In an analysis of the survey, Reid wrote that although Canadians' commitment to multiculturalism is not increasing, and in the wake of North American and European nationalist movements have affected the Canadian attitudes and have started to develop a preference to colorism in certain provinces. Reid also express' his uncomfortableness in the increasing illiterate refugee immigrants that can affect the Canadian society. However, he found that the majority of newcomers and refugees feel that they are treated fairly and welcomed as a "Canadian". A 2017 Poll found 32% of Canadians said too many refugees were coming to Canada, up from 30% in 2016. The 2017 poll also asked respondents about their comfort levels with surface diversity, like around people of different races and religions, a question that was also asked in 2005-06. This year, 89% said they were comfortable around people of a different race, down from 94% in 2005-2006. In 2018, an Angus Reid Institute poll, found that two-thirds of Canadians — 67 per cent — agree that the situation of Illegal immigration to Canada constitutes a "crisis" and that Canada's "ability to handle the situation is at a limit." Fifty-six per cent of respondents who voted Liberal in the 2015 election and 55 per cent of NDP supporters agreed that the matter had reached a crisis level, While 87 per cent of respondents who voted for the Conservatives in the last election called it a crisis. Six-in-ten respondents also told the firm that Canada is "too generous" toward would-be refugees, a spike of five percentage points since the question was asked last year. In a 2019 poll, by EKOS Research Associates, found about 40 per cent of Canadians feel there are too many non white immigrants coming to the country. In L'Express, the French news magazine, Canadian academic and environmental activist David Suzuki called Canada's immigration policy "disgusting" (We "plunder southern countries to deprive them of their future leaders, and wish to increase our population to support our economic growth") and insisted that "Canada is full" ("Our useful area is reduced"). ^ a b c Hussen, Ahmed D (November 2017). "2017 Annual Report to Parliament on Immigration". Canada.ca. Government of Canada. Retrieved 23 June 2018. ^ a b "Immigration and ethnocultural diversity: Key results from the 2016 Census". Statistics Canada. Government of Canada. 25 October 2017. Retrieved 23 June 2018. ^ James Hollifield; Philip Martin; Pia Orrenius (2014). Controlling Immigration: A Global Perspective, Third Edition. Stanford University Press. p. 11. ISBN 978-0-8047-8627-0. ^ Gary P. Freeman; Randall Hansen; David L. Leal (2013). Immigration and Public Opinion in Liberal Democracies. Routledge. p. 8. ISBN 978-1-136-21161-4. ^ Markus, Andrew. "Attitudes to immigration and cultural diversity in Australia". Journal of Sociology 50.1 (2014): 10–22. ^ ""Spirituality in a changing world: Half say faith is 'important' to how they consider society's problems", p. 15" (PDF). Angusreid.org. Retrieved 27 May 2018. ^ Grant, Tavia (28 September 2016). "320,000 newcomers came to Canada in past year, highest number since 1971". The Globe and Mail. Retrieved 13 October 2016. ^ Canada, Immigration, Refugees and Citizenship (2016-03-11). "Express Entry Year-End Report 2015 - Canada.ca". www.canada.ca. Retrieved 2018-10-10. ^ a b Bascaramurty, Dakshana (1 November 2017). "Canada aims for immigration boost to buttress economy as population ages". The Globe and Mail. Retrieved 23 June 2018. ^ Marina L. Smith, "The Immigration and Naturalization Service (INS) at the U.S.–Canadian Border, 1893–1993: An Overview of Issues and Topics", Michigan Historical Review 26, No. 2 (Fall 2000), 127–147. ^ Hall, "Clifford Sifton: Immigration and Settlement Policy, 1896–1905". ^ David Smith, Instilling British Values in the Prairie Provinces", Prairie Forum 6#2 (1981): pp. 129–41. ^ Janice Cavell, "The Imperial Race and the Immigration Sieve: The Canadian Debate on Assisted British Migration and Empire Settlement, 1900–30", Journal of Imperial and Commonwealth History 34#3 (2006): pp. 345–67. ^ Kurt Korneski, "Britishness, Canadianness, Class, and Race: Winnipeg and the British World, 1880s–1910s", Journal of Canadian Studies 41#2 (2007): pp. 161–84. ^ Promoting opportunity for new Canadians - Prime Minister of Canada Archived 2006-09-14 at the Wayback Machine. Pm.gc.ca (2006-05-12). Retrieved on 2013-07-12. ^ Colin Singer (June 15, 2015). "Canada: Canada Citizenship Reform: A Comparative Analysis". CCIRC (Canadian Citizenship & Immigration Resource Center). Retrieved December 26, 2015. ^ "Canadian Citizenship: Second Wave Of Changes Take Effect October 11, 2017 (Includes Audio) - Immigration - Canada". Mondaq.com. Retrieved 2018-02-14. ^ Cook, Tim. "Mackenzie King and the War Effort". The Canadian Encyclopedia. Retrieved 2018-02-14. ^ a b Annual Immigration by Category, Citizenship and Immigration Canada. Retrieved July 12, 2006. ^ "Canada to admit nearly 1 million immigrants over next 3 years". CBC News. Retrieved 27 May 2018. ^ "Canada to take 1 million immigrants by 2020". Sbs.com.au. Retrieved 27 May 2018. ^ "Canada to Admit Almost a Million Immigrants Over Next Three Years". Bloomberg.com. 2 November 2017. Retrieved 27 May 2018. ^ When immigration goes awry Archived 2013-01-16 at the Wayback Machine, Toronto Star, 14 July 2006. Retrieved 5 August 2006. ^ a b c Tweedie, Gregory; Dressler, Anja; Schmidt, Cora-Leah. "Supporting Reconnecting Immigrant Families with English Language Learners in Rural Schools: An Exploratory Study of Filipino Arrivals to Alberta". Retrieved 17 November 2018. ^ "Number Of Asylum Seekers At Quebec Border Nearly Quadrupled In July: Officials". HuffPost Canada. 2017-08-17. Retrieved 2018-03-16. ^ Woods, Allan (2017-08-23). "Canada is not a safe haven for asylum seekers, Trudeau warns". The Toronto Star. ISSN 0319-0781. Retrieved 2017-10-16. ^ "Trudeau says steps to tackle spike in asylum-seekers yielding 'positive results'". CBC News. Retrieved 2017-10-16. ^ Canada, Immigration, Refugees and Citizenship (2007-03-31). "Immigrate as a Quebec-selected skilled worker - Canada.ca". Canada.ca. Retrieved 2018-03-19. ^ Canada, Immigration, Refugees and Citizenship (2008-09-17). "Who can apply – Canadian Experience Class (Express Entry) - Canada.ca". Canada.ca. Retrieved 2018-03-19. ^ Canada, Immigration, Refugees and Citizenship (December 2017). "Immigrant Investor Venture Capital Pilot Program - Canada.ca". Canada.ca. Retrieved 2018-03-19. ^ Offering "Express Entry" to Qualified Economic Immigrants – Actively Recruiting Talented Newcomers For the Benefit of Canada's Economy. (Archived) Government of Canada, April 8, 2014. ^ "Alberta Immigrant Nominee Program (AINP)". ^ Chisholm, McMillan LLP-Damon; Kuehn, Scott. "BC Government Targets Foreign Buyers with Massive Tax Hike – Lexology". Lexology.com. Retrieved 19 August 2017. ^ Markusoff, Jason (Jan 10, 2018). "Canada's failing refugee system is leaving thousands in limbo". Maclean's. Retrieved 24 July 2018. ^ Harris, K (21 January 2018). "Less than half the people deported from Canada in 2017 paid their own way home". CBC News. Retrieved 24 July 2018. ^ a b c d Canada, Immigration, Refugees and Citizenship (2007-03-31). "Find out if you're eligible – Refugee status from inside Canada - Canada.ca". Canada.ca. Retrieved 2018-04-04. ^ "How asylum seekers make refugee claims, and why they take so long". CBC News. ^ Arbel, Efrat (2013-03-01). "Shifting Borders and the Boundaries of Rights: Examining the Safe Third Country Agreement between Canada and the United States". International Journal of Refugee Law. 25 (1): 65–86. doi:10.1093/ijrl/eet002. ISSN 0953-8186. ^ Marwah, Sonal; Ball, Michelle (Autumn 2017). "Is the Safe Third Country Agreement putting refugee claimants at risk?". Ploughshares Monitor. 38 (3): 5–9. ^ Foster, Michelle (Fall 2008). "Responsibility Sharing or Shifting? "Safe" Third Countries and International Law". Refuge. 25 (2): 64–78. ^ a b Dawson, Carrie (2014). "Refugee Hotels: The Discourse of Hospitality and the Rise of Immigration Detention in Canada". University of Toronto Quarterly. 83 (4): 826–846. doi:10.3138/utq.83.4.826. ^ a b Silverman, Stephanie J.; Molnar, Petra (2016-03-01). "Everyday Injustices: Barriers to Access to Justice for Immigration Detainees in Canada". Refugee Survey Quarterly. 35 (1): 109–127. doi:10.1093/rsq/hdv016. ISSN 1020-4067. ^ "2017 Annual Report to Parliament on Immigration". Cic.gc.ca. Citizenship and Immigration Canada. 2018. Retrieved Dec 22, 2018. ^ "Citizenship and Immigration Canada, Facts and Figure". Cic.gc.ca. Citizenship and Immigration Canada. 2017. Retrieved Jul 21, 2018. ^ "Citizenship and Immigration Canada, Facts and Figure". Cic.gc.ca. Citizenship and Immigration Canada. 2016. Retrieved Oct 31, 2016. ^ "Projections of the Diversity of the Canadian Population". Statistics Canada. March 9, 2010. Retrieved 2010-03-15. ^ "Parties prepare to battle for Immigrant votes". CTV.ca. 2010-03-14. Archived from the original on 2010-03-16. Retrieved 2010-03-15. ^ Canada, Government of Canada, Statistics (2017-10-25). "Immigration and Ethnocultural Diversity Highlight Tables - Immigrant population by place of birth, period of immigration, 2016 counts, both sexes, age (total), Canada, 2016 Census – 25% Sample data". 12.statcan.gc.ca. Retrieved 27 May 2018. ^ "Harper says foreign worker program is being fixed - PM defends recent changes to EI and foreign worker program". CBC News. 2013-05-07. ^ "Settlement Worker - Alternative Jobs". settlement.org. ^ "American UVic prof forced to leave Canada after immigration rules son's autism too big a taxpayer burden". Daily Brew. March 31, 2012. ^ a b "Family faces deportation over son's autism". Toronto Star. June 9, 2011. ^ "Canadians want illegal immigrants deported: poll". Ottawa Citizen. CanWest MediaWorks Publications Inc. 20 October 2007. Archived from the original on 20 October 2010. Retrieved 2010-10-18. ^ "James Bissett: Stop bogus refugees before they get in". National Post. 27 September 2007. Archived from the original on 24 September 2015. Retrieved 2015-09-04. ^ CTV News Staff (2008-05-06). "Canada has lost track of 41,000 illegals: Fraser". CTV News. Retrieved 2018-01-31. ^ "Chapter 7—Detention and Removal of Individuals—Canada Border Services Agency". 2008 May Report of the Auditor General of Canada. Office of the Auditor General of Canada. May 2008. Retrieved 2018-05-02. ^ "What makes us Canadian? A study of values, beliefs, priorities and identity". The Angus Reid Institute. 3 October 2016. Retrieved 2016-11-09. ^ "Canadians aren't as accepting as we think — and we can't ignore it, writes Angus Reid". Cbc.ca. ^ "Canadian attitudes towards immigration hardening, poll suggests - The Star". Thestar.com. Retrieved 27 May 2018. ^ "David Suzuki and Jason Kenney amplify each other". The Globe and Mail. Toronto. 2013-07-15. Retrieved 2013-10-04. Lacroix, Patrick (2016). "From Strangers to 'Humanity First': Canadian Social Democracy and Immigration Policy, 1932-1961". Canadian Journal of History. 51 (1): 58–82. doi:10.1353/cnh.2016.0028 (inactive 2019-03-16). McLean, Lorna "'To Become Part of Us': Ethnicity, Race, Literacy and the Canadian Immigration Act of 1919", Canadian Ethnic Studies, 36#2 (2004): pp. 1–28. Timlin, Mabel F (November 1960). 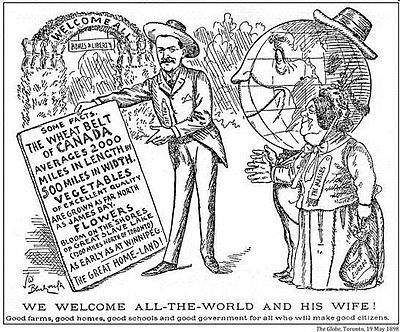 "Canada's Immigration Policy, 1896-1910". Canadian Journal of Economics and Political Science. 26 (4): 517–532. doi:10.2307/138931. JSTOR 138931. Going to Canada - Immigration Portal: A source of free and useful information for newcomers and prospective immigrants to Canada.